I have struggled with what I would say in this review. I feel like I give my readers a glimpse of who I am with each post and book read. Well In Search of Lucy may have hit a bit too close to home and not a piece of me I want to share with the world. So how to tell you about the book without telling you about me. It's kind of impossible. Lia Fairchild has potential as a writer. However, with this novel she has not quite met the mark. The numerous grammatical and word choice errors interrupted the flow of the story as I had to remind myself that this was not a manuscript I was editing. Lia does a great job of capturing the isolation, loneliness, and desperation of main character Lucy. I often found myself on the verge of tears and even cried as a read the last few pages of the book. It was a good emotional release. 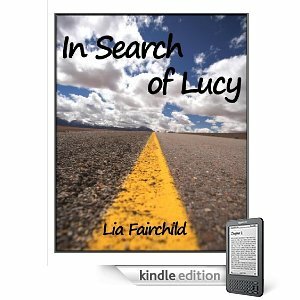 But Lia falls short of elevating the emotions of the reader as Lucy discovers her need for change in her life. I don't mind reading depressing novels (sometimes the darker the better is my motto), but I want a life affirming happily ever after in the end. I felt the ending was rushed and, after almost 200 pages of exploring dark emotions, did not provide sufficient evidence that Lucy would be okay. Like I said Lia Fairchild and In Search of Lucy shows promise, but I think the ending could be reworked (or elaborated on) to give the reader more closure and definitely needs to be looked over by an editor. When I am looking for a good cry I will consider reading it again as it did feel good to release some of my own emotions. I'm having a similar experience with a memoir that I'm reading right now. It was offered, and I accepted without researching it further. I'm having a hard time reading it, making it through about 40 pages or so at a time. I will make it, though, and I hope that it helps me deal with some stuff. Whether or not I actually review it, however, remains to be seen. I'm glad you got something out of it, even if it was just a good cry. What an intriguing review - and comments! Sounds promising.